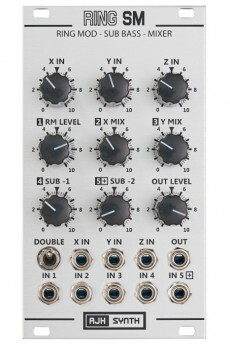 The AJH Synth Ring SM is a unique new Eurorack module that features a three input discrete transistor Ring Modulator core, two shaped sine Sub Bass generators and a five channel discrete transistor mixer with extra distortion capability; all within 14HP of Eurorack Modular panel space. The RING SM module is quite unique because its ring modulator circuit is based on a discrete transistor AC coupled Gilbert Cell design dating back to the early 1960's. The overload and distortion characteristics are rather different and more musically useful. There´s a third Z input in addition to the usual Carrier (X) and Modulator (Y) inputs seen on other ring modulator designs. The Z Input is actually a second modulator input that has a different phase relationship with the ring modulator core and it can produce a more resonant sound when it is used. All three inputs (X, Y, and Z) can be used simultaneously. The “Double” switch connects the X (carrier) input to the Y (modulator) input, so that if a Sine wave or Triangle wave is applied to the X Input then this will be doubled and the RM output will be one octave higher than the X input - no Y input is necessary for this to be generated. Sub Bass -1 produces a shaped sinewave output one octave below the waveform applied to the X IN Input. 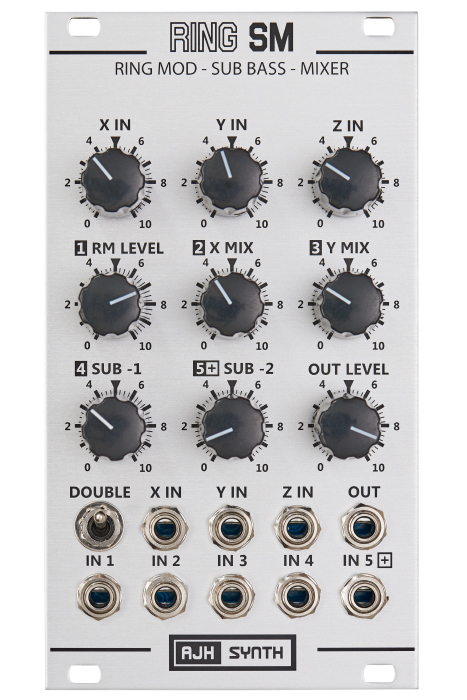 Sub Bass -2 produces a shaped sinewave output two octaves below the waveform applied to the X IN Input. The Sub Bass waveforms are not square waves but vary from a trapezoid wave with rounded edges at lower frequencies to sine like waveforms at higher frequencies and are useful up to 1kHz. They have a much lower harmonic content than regular square wave subs, they have been specifically designed sit much better in a mix and appear to have more drive and punch. 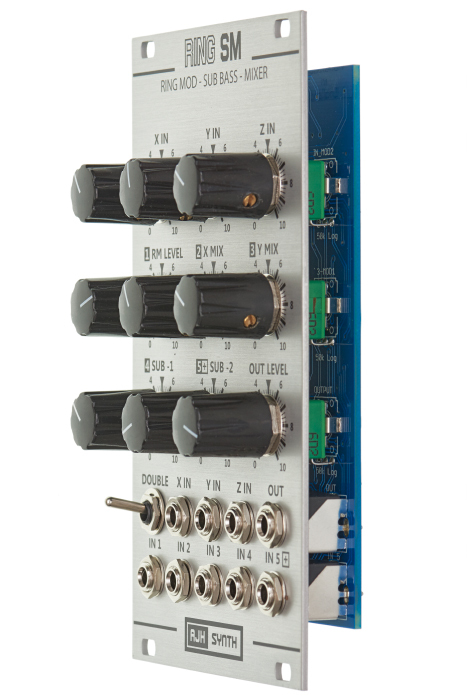 Also included is a five input, DC coupled mixer based on the discrete transistor CP3 modular design dating back to the early 1970’s. This uses discrete transistors rather than integrated circuits for the mixer core, because of its negative feedback loop and virtual ground circuit topology it actually performs quite well in this role, with no interaction between inputs and relatively low distortion - until it is overdriven. The mixer inputs are IN 1, IN2, IN3, IN4 and IN5 jack sockets - however, when there is no patch lead inserted into these Input jack sockets the outputs of the Ring Modulator and Sub Bass Generators are automatically routed (normalised) through the mixer internally. Plugging a patch cable into any of the mixer inputs defeats the normalising for that particular input and allows it to be used as a regular mixer for both audio and control voltages. 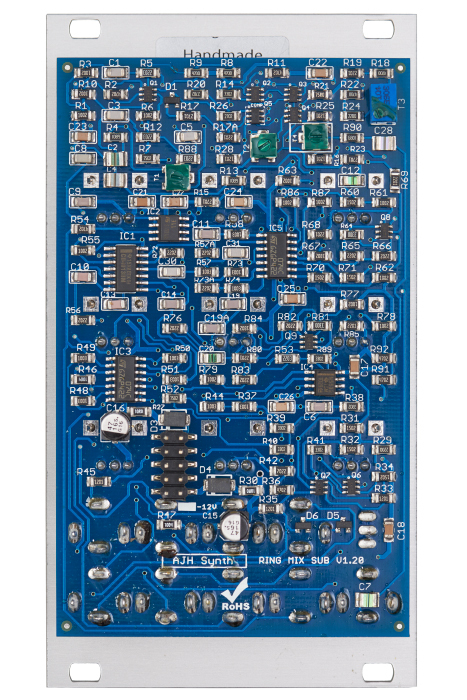 Because the mixer section is DC coupled, it can be used to mix control voltages in addition to just audio signals, or it can even mix both audio and control voltages simultaneously, which allows it to be used as an asymmetric distortion module.